The unicorn is dipping his horn into the water from the well, in this scene "Unicorn At The Fountain II". From the original series of the Hunt of the Unicorn tapestries, this scene shows the unicorn cleansing the village water of impurities to enable the forest animals to drink from it, as the royal hunstmen and their hounds watch closeby. There are pheasants drinking from the fountain itself. 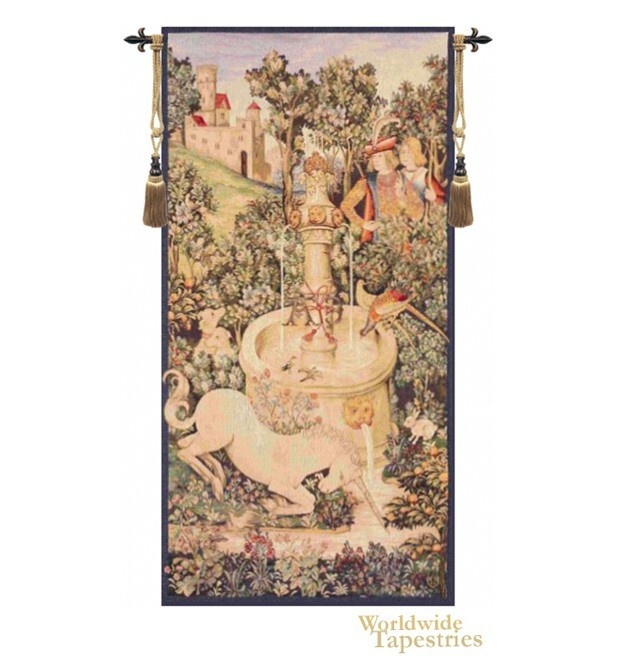 This tapestry "Unicorn at the Fountain" is backed with lining and tunnel for easy hanging. Note: tapestry rod and tassels, where pictured, are purchased separately. Dimensions: W 29" x H 58"